Keep a loved one close to heart with our enchanting Flat Heart Locket Necklace. A stunning piece of jewellery for Valentine’s Day, Weddings, and Milestone Anniversaries, it is handmade in hallmarked sterling silver, beautifully presented on a fine box chain, and designed to accommodate 2 of your favourite photos. Perfect for new mums, and a popular gift choice for bridesmaids and flower girls, our Silver Heart Lockets are offered in a choice of three different sizes to suit every taste. The chain on which they are presented come in 8 different lengths, and as with all the handmade jewellery in our exclusive online collection, they are delivered in a designer gift box ready to delight the lucky recipient. Classic pieces such as this one are fantastic additions to your jewellery box because there are endless ways to style them! 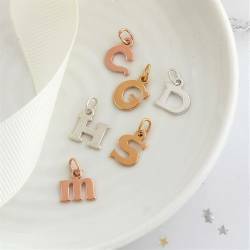 You can create a bespoke necklace by adding charms such as a number charm to celebrate a milestone birthday, such as 16th, 18th, 21st, 30th or a special anniversary. Or perhaps their Zodiac star sign on a silver charm. Or perhaps you would like just your families birthstones, or their initials. You will find the full range of charms in the charms section. Unfortunately we are unable to offer engraving at this time and we can't insert your photos for you. The locket will fit 2 images and maybe a secret message from you to her. Your locket necklace will be carefully packaged in a stylish matte-black gift box and finished with an ivory satin ribbon. This service is completely free of charge. 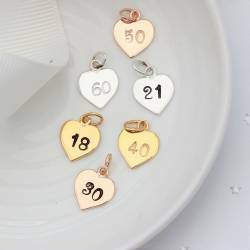 The medium heart locket measures approx. 2cm wide and hangs approx. 2.5cm from the chain. The large heart locket measures 2.7cm and hangs approx 3.6cm from the chain. The sterling silver box chain is available in 8 lengths approx 14"/35cm with a 3cm extension chain (choker) 16"/40cm,18"/45cm, 20"/50cm. 22"/55cm, 24"/60cm,26"/65cm, 28"/70cm or 30"/75cm.